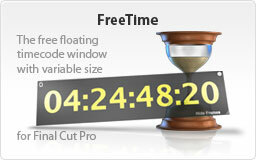 FreeTime is the large timecode window for Final Cut Pro* (Version 5.x to 7.x). It shows the current timecode from Viewer or Canvas. The main window of FreeTime always floats above all other windows, it can be freely positioned and scaled on the attached screens. During the work in Final Cut Pro* the window controls of the timecode window are hidden. Only the size box is always visible. If the timecode window should be lost, it can be placed back – in standard size and standard translucence – on the center of the main screen. Use the option in the window menu or the shortcut “Command W”. Notice: During Capturing, “Print To Video” or “Edit To Tape” FreeTime does not indicate a timecode. Not every font is suitable font. Try and find out wich font works the best for you. * Final Cut Pro is a registered trademark of Apple Inc. All rights reserved. All offers of this web site are 100% freeware. Nevertheless the developer will be pleased about a small regard.